Prism grout is much lighter than standard sanded grout. What would normally be a 25-pound sack weighs only 17 pounds, however, Prism will provide the same coverage as the standard grout. 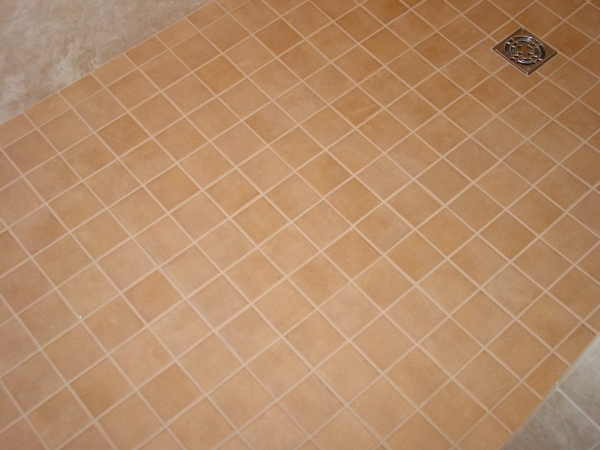 Several members of the John Bridge Ceramic Tile Forums were selected to field test the new grout. I’m fortunate to have been one of them. I tested Prism “Haystack,” one of Custom’s most popular colors, on a Kerdi shower in a new home being built in the Texas Hill Country west of Houston. Weather conditions were mild, but humidity was a bit above the seasonal norm. 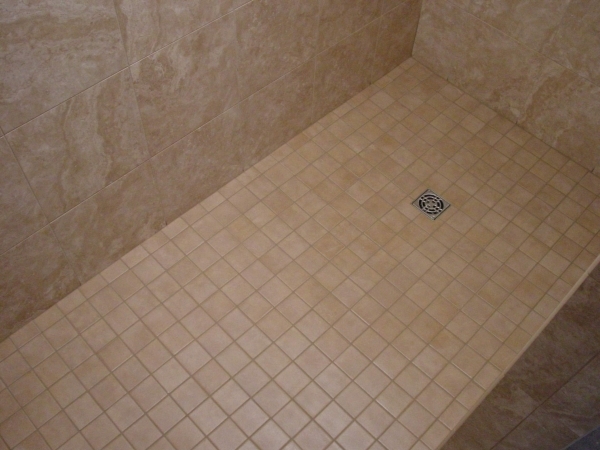 The shower included walls, floor and ceiling — dense porcelain tile throughout. 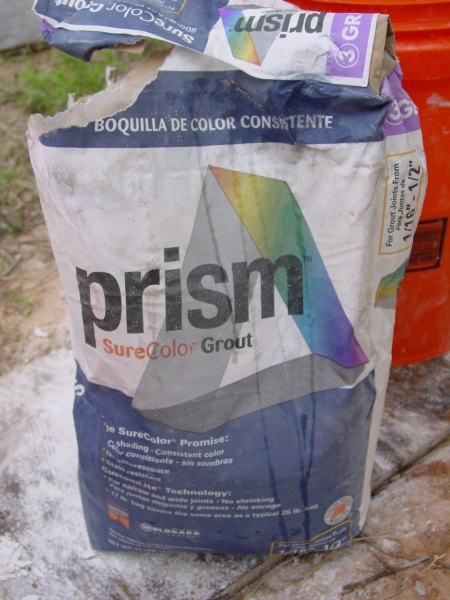 I’m not a newcomer to Prism grout, having used the original Prism on a Houston patio in 2005. Although I thought highly of the product, others apparently had problems with it, and it was ultimately withdrawn from the market. The first thing you’ll notice about the new Prism grout (aside from its light weight) is its ease of mixing. Prism doesn’t clump up as does standard sanded grout. 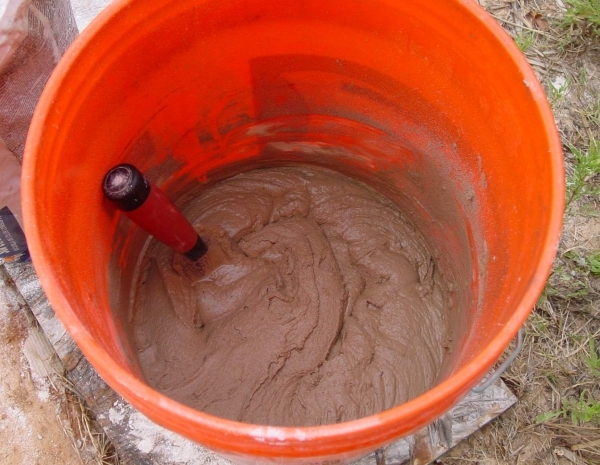 Put a little water in the bucket, dump in some grout and give it a stir with a margin trowel. Before you know it, you’ve got a smooth even paste. Let it slake 10 minutes and then re-stir. It’s easy to whip Prism to a uniform paste with only a margin trowel. So mixing was the easy part, but now it was time to get the grout into the joints, and lucky me, I had a ceiling to break in on. Most of the first effort ended up on the floor. I soon found that Prism grout just plain doesn’t like to be squeezed into joints. And it’s not particularly fond of adhering to tile surfaces. As I attempted to push the grout in it seemed to pull right back out with the trailing edge of the grout float. At this point I was using a soft rubber float with a neoprene face. I had to constantly scrape grout from the side of the float, as that was the only place the grout actually wanted to stick. In talking to some of the others who tested Prism, I found I was not alone. Everyone complained of the difficulty in getting the grout into the joints and keeping it there. Be prepared to spend about twice as much time as usual in filling and smoothing the joints. It is, of course, easier to slap the grout on the wall and then push it up onto the ceiling. I finally resorted to grouting one joint at a time. After several joints I would try to get as much of the excess off as possible with the edge of the float. I switched to a fairly hard epoxy float, and that seemed to help considerably. By grouting one joint at a time and then going back over it with the end of the float I was able to get most of the grout to hang in the joints. With a feeling that approached utter joy I finally finished the ceiling and upper walls and began washing. You’ll be happy to know that Prism grout is not hard to wash. Wring your sponge tightly. Don’t slop any excess water onto the surface. I went over the surface once and got the bulk of the material off while making sure all the joints were full. At this point the grout in the joints was still a bit loose, even though the surface area was completely dry. I didn’t time it, but I think about 30 minutes elapsed between beginning to smear the grout and the start of the wash cycle. I would not want to let it go any longer than that. When washing Prism, water seems to stay on the surface of the joints, and even after rinsing with the sponge tightly wrung I noticed small beads of water in many of the joints. I was sure this would cause discoloration, but there wasn’t much I could do except to let the grout dry. As I said earlier, it was a humid day, but humidity would not have caused the phenomenon in standard grout. You can see water beading out of the joints. I attempted several times to sponge the joints, but nothing seemed to improve the condition. After the grout had partially dried I was able to clean up the joints a bit with the sponge. 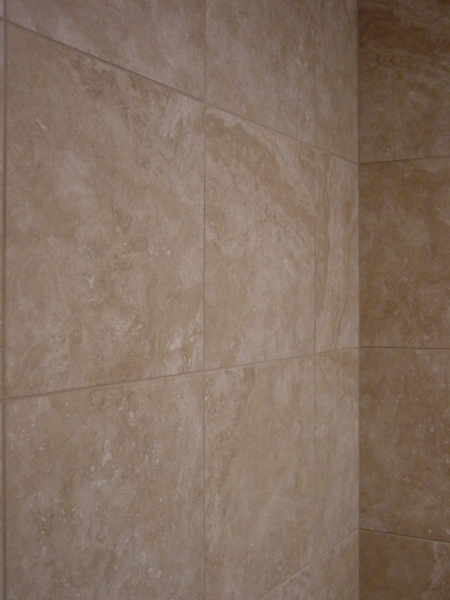 I did the best I could and continued on to the lower walls and shower floor, which is tiled with 3-inch porcelain tiles. The floor went much better, of course. Gravity is your friend here. I was able to get the joints looking good with comparatively little effort. The grout still pulled out of the joints, but the process was much smoother. You force the grout into the joints and then go back a time or two to try to get it smooth and even. Then move on. 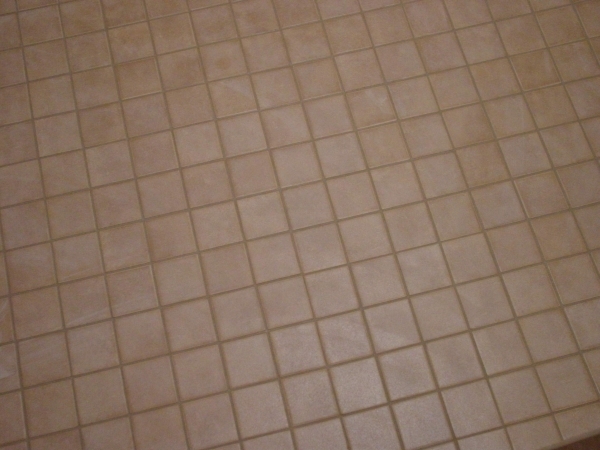 Don’t continue to toy with the grout. Let it set up, and then wash. Whereas getting the grout applied is a bit of a challenge, washing is a breeze. 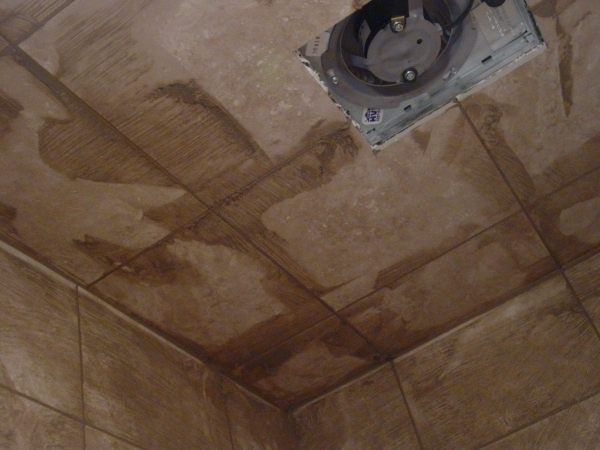 It’s not difficult to remove all the residue from the surface of the tiles. You can see water on the surface of the joints. I found no way to remove it completely. 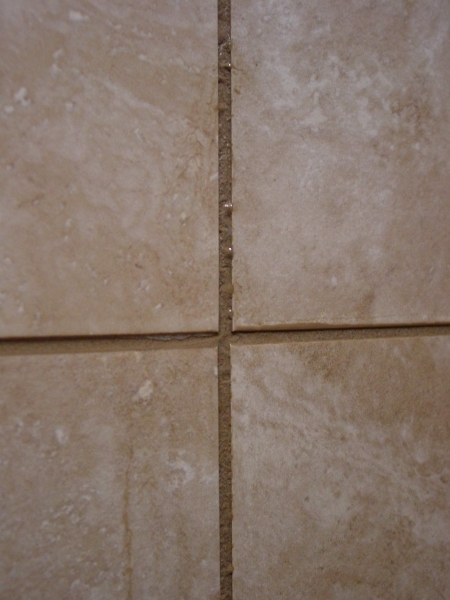 Leaving standard sanded grout like this would definitely result in a splotched grout job. Surprisingly, the grout job looked good when dried. And when Prism grout decides to dry it does so rather quickly. I did have to touch up a few joints on the walls, but the floor appeared to be perfect. All in all, I was not displeased with the result. Wall joints are almost dry. Throughout the drying process the grout shading was even. The walls and ceiling are looking good. The floor joints look perfect. Both wall and floor joints were drying evenly, and at this point it was time to go home. You can best see the color uniformity in the floor. I don’t think I’ve ever seen a better grout job. 1. I think I might have had the grout mixed a little loose. I tried to keep it as stiff as possible, but I had such difficulty getting it to cling to the ceiling and walls that I loosened it up a bit. I still had a pasty consistency, but next time I’ll keep it a little stiffer. 2. There is no way to easily get the grout into the joints and get it smooth the first time over, but I think the result is worth the effort. Prism is good grout. 3. Next time I’ll try to wait for a day with less humidity. High humidity and the fact that it wasn’t warm enough to run the air conditioner worked against me. Had I run the air, I think the grout would have dried more readily. Also, my test shower was tiled over the Schluter Kerdi® membrane, which is impervious, so no moisture was absorbed by the substrate.The grout will work better over more porous backings, and Prism will certainly perform better in summer in every part of the country. Finally, although Prism grout will tax your patience while installing it, washing is not difficult, and the end result is worth the effort. 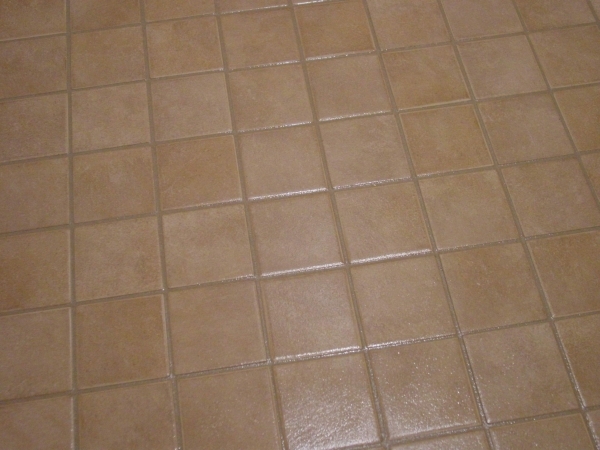 I truly have never seen a better looking grout job using portland cement grout. Using the product is a learning experience, and I think experience will speed the process. 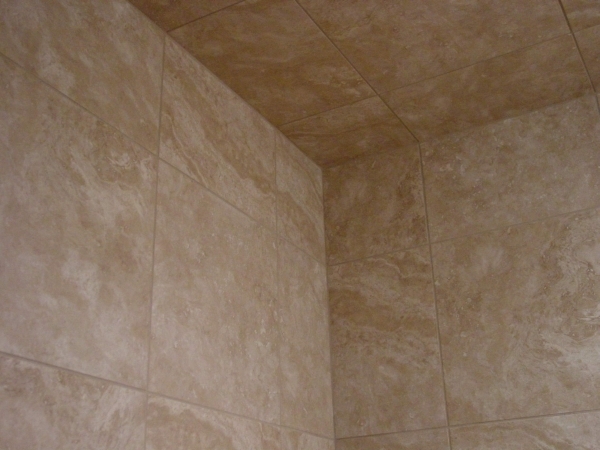 It is possible to abuse Prism grout and still come out with an outstanding looking job. I can’t say that about any other grout. Although my fellow product testers might not agree, I’ll use Prism grout whenever I can.